Lessons from the mud | Blog? What blog? 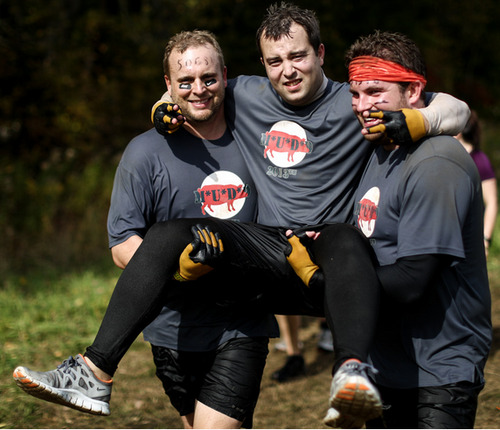 This is a 2-part post that talks about my first Tough Mudder experience, which took place on September 29th at Mount St. Louis Moonstone. This first part looks at takeaways from the day. 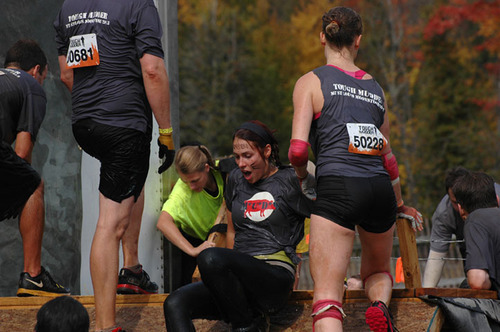 Part 2 is a review of each of the obstacles. 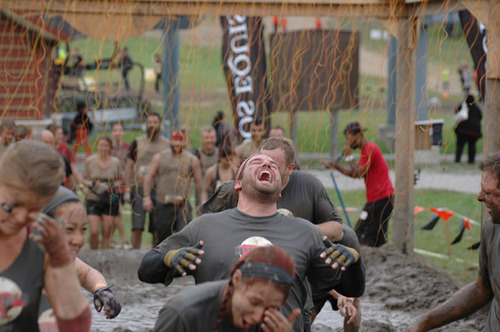 The first thing anyone asked me when I told them I had signed up for Tough Mudder was “Why?” This was often accompanied with a face that showed a combination of confusion, disgust, and disbelief. I actually know what that face feels like to wear because I’d worn it in the past when hearing about and being invited to participate. Why would anyone subject themselves to what everyone describes as the most gruelling challenge you’ll ever endure in your life? The question kind of answers itself. It’s because you know and everyone knows it’s going to be tough that you do it. Simply put, to see if you can. ”That which does not kill us makes us stronger,” said Friedrich Nietzsche. And it’s true. Every one of us who crossed that finish line on that day was bursting with that “I can do ANYTHING” feeling — such a high. But in order to get it, you have to put in the work. 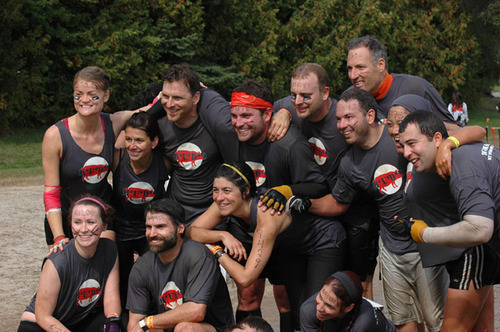 Our team was made up of current ING DIRECT employees, alumni like me, and a few other friends. 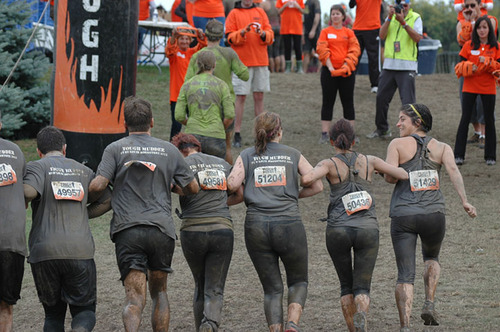 Teamwork is one of the themes of Tough Mudder. There are some obstacles, such as Mount Everest, that only the Herculean can do on their own. 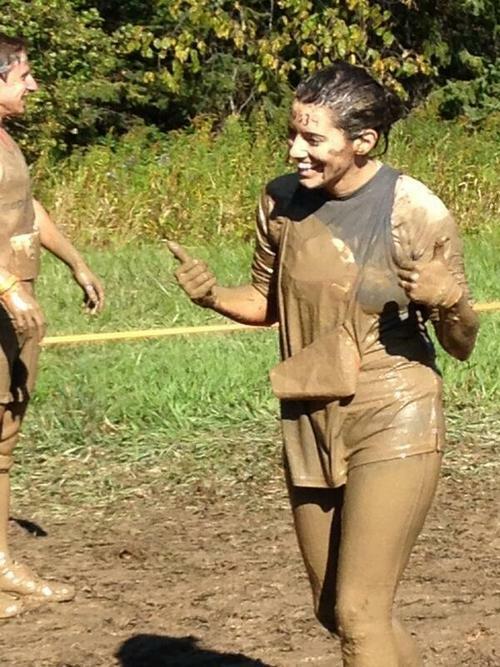 Even if you are Mudding solo, as our Megan did, the other Mudders are more than happy to help you out. At one point, our team even adopted an orphan, inviting her to be a part of our group of 14. Being a part of a great team makes you realize how important it is. Put slightly differently, “Peer pressure,” said Rick. “Getting up that first hill it was the thought that I can’t be the only one not to finish, I told everyone I was doing this!” agreed Megan.When under the watchful eye of others, there is an added accountability and drive to finish what you set out to do. 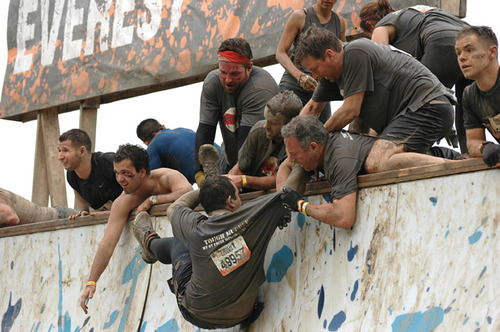 With the exception of Peter, none of us had done Tough Mudder before. We each had an idea of what to expect. 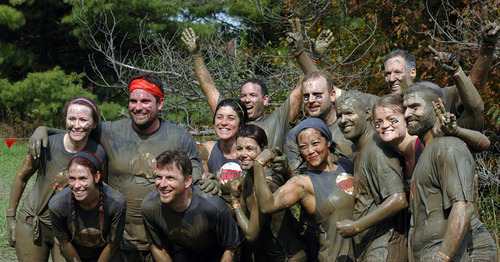 Sure, we’d visited the web site, watched the videos, and read the blogs, as well as talked to past Mudders, but everyone’s experience is different. Those who had trained (which some of us did as a group, led by Sofia from Body At Work), felt confident and ready. “I felt really good and prepared. I ran 5k on the 28th and it was like floating,” said Julian. And some, like Jessica, were buoyed by their personalities. “I felt comfortable going into it, not only because I had been training but because I’m too stubborn of a person to give up.” Others, despite having trained, let the hype get to them. Rick: “I was scared sh*tless!”Confidence is one of your most important muscles to build. 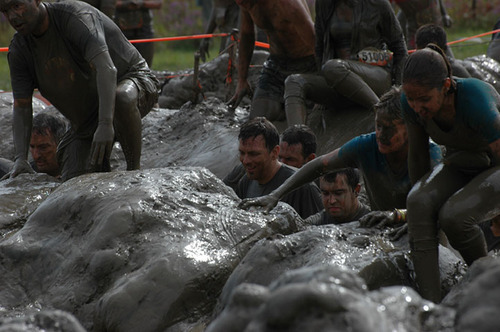 When asked for their favourite obstacle, the most common answer given was the “Funky Monkey”, which involved hand-over-hand traversing of monkey bars over muddy water. Also common was the reason why. “Going in, I was certain I wouldn’t be able to complete it given my spaghetti-like arms,” said Jessica. “Turns out, I was one of few who conquered that obstacle.” As Megan pointed out, part of the enjoyment was acknowledging the challenge. 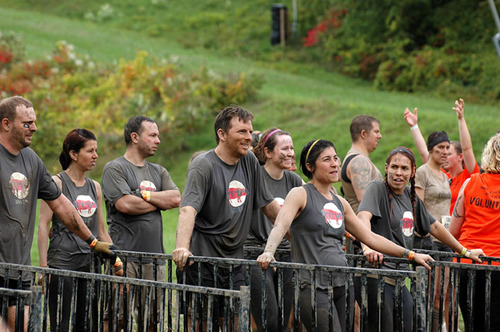 “I liked Cage Crawl, Smoke Chute, and Walk the Plank, but I think they were a little too easy so you didn’t walk away with bragging rights you know?” One’s sense of accomplishment is directly-related to the size of the challenge. 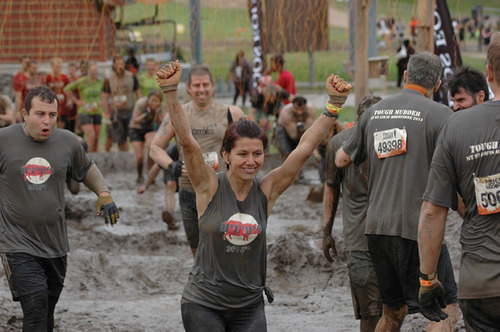 The bigger challenges proved to be those that relied on a Mudder’s mental chutzpah. “Walk the Plank” had quite a few team members questioning themselves as they stood on a platform 15+ feet high, looking down at mud-opaque water below. The other obstacle that elicited the most anticipatory fear was “Arctic Enema”, a plunge into a vat of frigid ice-cubed water, which necessitated participants to dunk their heads in the middle to get under a barbed wire-topped submerged plank of wood. In these cases, the obstacle was not in front of us, but rather, in our heads. The trick is to focus on the end result, rather than the hard part, which is inevitable, so you might as well just get going. 3 weeks since finishing Tough Mudder, my bruises have faded and my scrapes are just about healed. In the week following the event, I found myself missing the feelings of that day — the camaraderie, the adrenaline, the sheer effort expended in order to get through. Without a big enough challenge, sometimes it can feel like you’re just coasting, going nowhere. Which is OK sometimes, but sooner or later, whether you admit it or not, you’ll need to get down in the muck, if for nothing else, for the high you get once you’re out.